Pssst! Have you been lucky enough to spot all the fairies on your visits to Fairyland? Meet all your favourites, plus some fresh faces, in this magical guide! 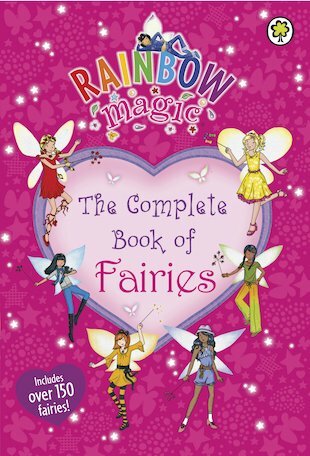 Normally so shy, the fairies reveal all their secrets in this very special and beautiful book, which introduces you to over 150 fairies from every single story to date. Go back to the very beginning, when Rachel and Kirsty first met Ruby the Red Fairy. Or fast-forward to some funky newer friends like Olympia the Games Fairy and Elizabeth the Jubilee Fairy! The colourful pages of this book are packed with beautiful pictures, exciting profiles, magic spells, fairy fashions, inspirational hobbies, maps, rhymes and little-known fairy facts. It’s the perfect treasury to keep on your shelf – and prepare you for your next trip to Fairyland!